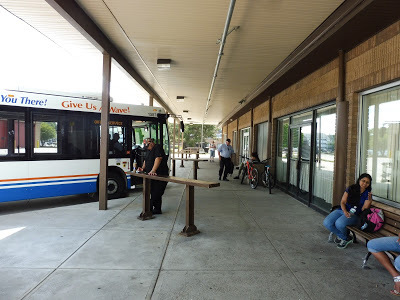 Welcome to your GATRA gateway to Taunton: the Bloom Bus Terminal! This amazing hub offers you everything from…uh… This amazing hub offers you quite a few things, like…um…uh… THIS PLACE IS AWFUL AND I’M HERE TO TELL YOU ABOUT IT. LET’S GET GOING. 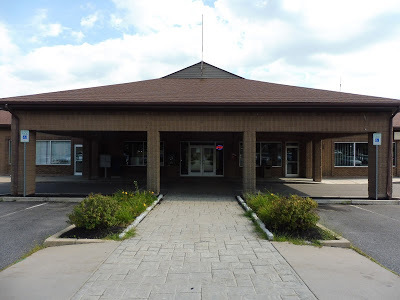 The Bloom Bus Terminal is located in an industrial area, in which many parking lots abound. Bloom is no exception, and though I can’t find exactly how many spaces the lot contains, it seems like an adequate amount. As for the building itself, it’s really dated (especially considering it’s only from 1990), right down to the flashing “open” sign on the outside. Really??? Another view of the inside. Alright, well, what kind of amenities do we have in the main concourse? Let’s see…there are some benches. That’s nice. We’ve also got some GATRA schedules, which vary in quality and style for each route (I could write a whole separate rant about how inconsistent GATRA’s paper schedules are). There’s also a GATRA ticket machine, right next to an incredibly sketchy-looking ATM. Finally, the GATRA administrative offices are here, accessed by an elevator. I think the original intent of this place was to be a “bus hub/retail hub” kind of thing, like New York’s Penn Station on a much smaller scale (or even something like Alewife). Unfortunately, it seems like things didn’t go to plan, as many of the retail spots in the Bloom Terminal are just…nothing. Are they under construction? Who knows! They looked pretty dormant when I was here. 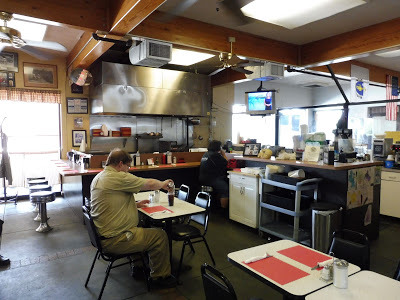 Inside the Oak Street Café. 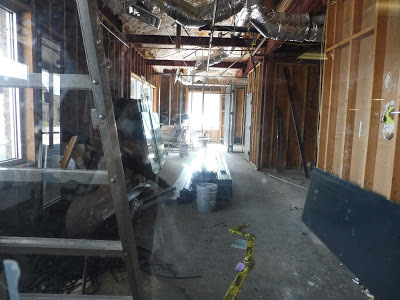 That’s not to say that all of the retail space is empty. 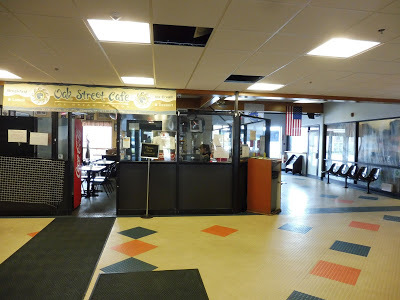 There are three businesses located within the terminal, and the most noteworthy one is the Oak Street Café. It’s…fine, I guess. It has a local feel inside, and offers a good amount of food – it just seems to attract characters. Still, nothing you wouldn’t expect from this terminal. As for the other two businesses, one is a tax office that’s only open on Wednesdays, so we can ignore that. The second one, however, is a proper driving school! 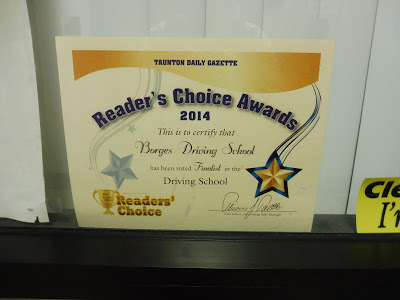 I have no idea how reputable it is (its website is full of grammatical errors, and the outside of its Bloom location is littered with 90s car safety posters), but we can safely say that it has been voted “finalist in the driving school” by the Taunton Daily Gazette! Not only is the category name priceless, but I like how the certificate contains both “Reader’s” and “Readers'”. Great job! Are we…going the right way? 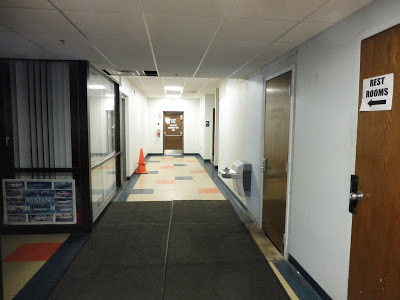 A paper sign written in Impact announces that the “REST ROOMS” are down a forlorn-looking hallway. To get into the “REST ROOMS’, you have to obtain a key from the Oak Street Café, which makes sense (they don’t want people loitering). However, why is it that the men’s room has a plaque saying “MEN” to the side of the door, while the women’s room has its sign written on the door? Come on, be consistent! 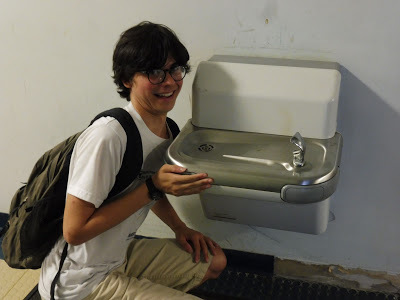 That is a tiny water fountain! Thanks to my friend Sam for taking the photo. I’m gonna need a full paragraph to rant about the Bloom Terminal’s single water fountain. IT. IS. SO. SHORT. Look at that picture – I’m 5’8″, which is about the average height for American males. So why should I, or any other person of average height, have to crouch down so low to reach this water fountain?? That being said, no one needs to crouch down for it, because it doesn’t even work. HOORAY! Okay, admittedly, the outdoor boarding area isn’t that bad. It’s pretty basic, with benches lined up along the building and a few wastebaskets, but it’s sheltered and it gets the job done well. There are also some tall wooden things at each bus bay, and though I have no idea what they are, they’re quite fun to sit on. 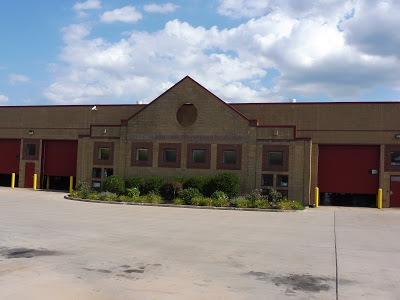 It’s worth noting that the GATRA maintenance facility and yard is located here as well. This is where they keep all of their full-sized buses (I believe), as well as many of their Dial-a-Ride buses. The Operations Office is actually open to the public – people can go in there to buy passes. It seems pretty antiquated, but…yeah, it’s really antiquated. I’m surprised electronic fare machines aren’t better-utilized by GATRA. A trio of buses at the terminal. 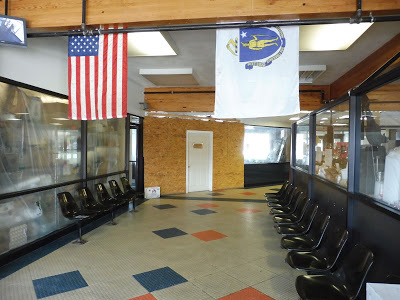 Ridership: This is a hub that serves GATRA’s busiest route, as well as a number of other good-ridership ones, so it attracts a decent amount of people. Commuters to Boston also use this terminal, as this is a stop for Bloom coach buses into the city (hence the terminal’s name). It seems like most people wait in the outdoor area, since the terminal itself was mostly empty aside from the café. Pros: The outdoor area is…functional. Okay, that’s it for pros. Cons: Well, it would be a bit of a waste to basically just go over everything I said in the review, wouldn’t it? Let’s make this quick: BASICALLY EVERYTHING. There is so much wrong with the Bloom Terminal, from its emptiness to its atmosphere to its WEIRD TINY WATER FOUNTAIN. Ugh! Nearby and Noteworthy: Downtown Taunton is a bit of a walk from here, but it can certainly be done. 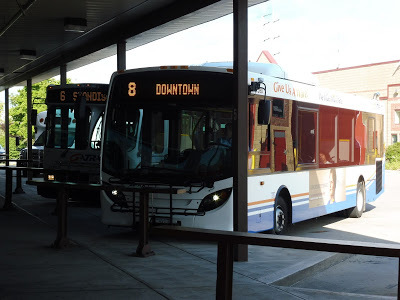 If you’d rather not go on foot, you can take the GATRA 7, 8, or 9 to get there. Well, isn’t it obvious? This is one of the rantiest (and also most fun) reviews I’ve ever written, and it’s easy to see why…this place is just awful! I think I documented all of its faults pretty well in the body of this post, so I won’t repeat myself again, But yeah…not a nice place. At all. The Oak Street Cafe actually has excellent diner food. It's probably the best thing about that building…by far.